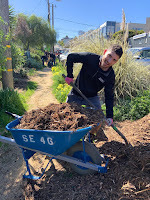 Pennsylvania Street Gardens: Workday with Juul a success! 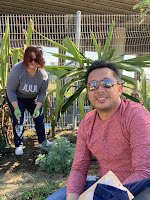 Workday with Juul a success! Today we had a 3 hour corporate workday at PRG with local company Juul. They sent along about 30 very enthusiastic employees who worked their tails off to make our neighborhood a nicer place to be, and they far exceeded my expectations! 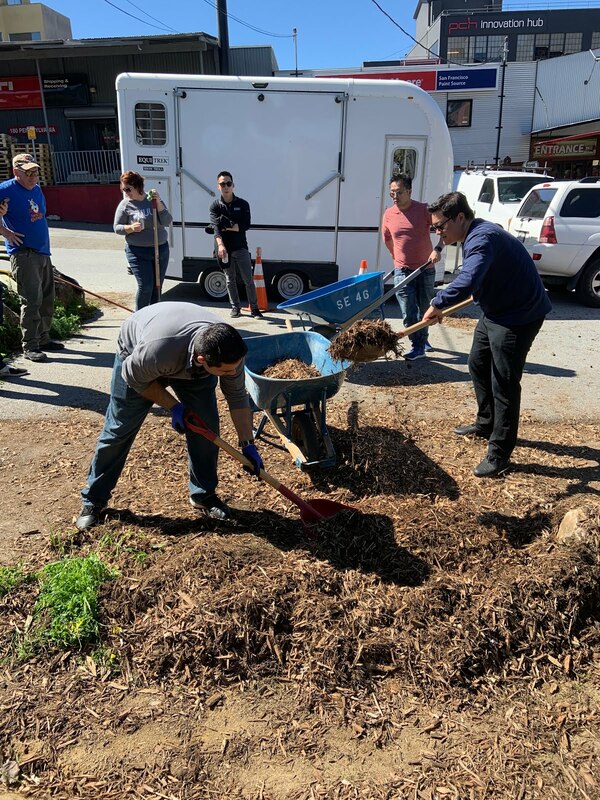 There was a lot of prep for this workday - pre-weeding, ordering wood chips, blocking off parking spots for the chip dump, picking up tools from DPW (and returning them), picking up drinks for everyone, packing the trailer and a thousand other details. At 11am I had 10 cubic yards of wood mulch delivered by Miguel from Bayview Green Waste - a pile that was a bit daunting, if I am honest. I was really grateful to get volunteer leadership help from Chris, John, and Gina today: thanks for answering a million questions and keeping everyone going with great cheer all day! And the Juul team was full of energy! I divided them into two teams - weeding and mulching. 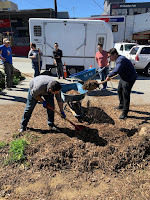 All the beds needed to be weeded, then have a thick layer of weed-supressing mulch laid on top. And of course while that was going on, trash needed to be picked up and divided into recyclables and non-recyclables. 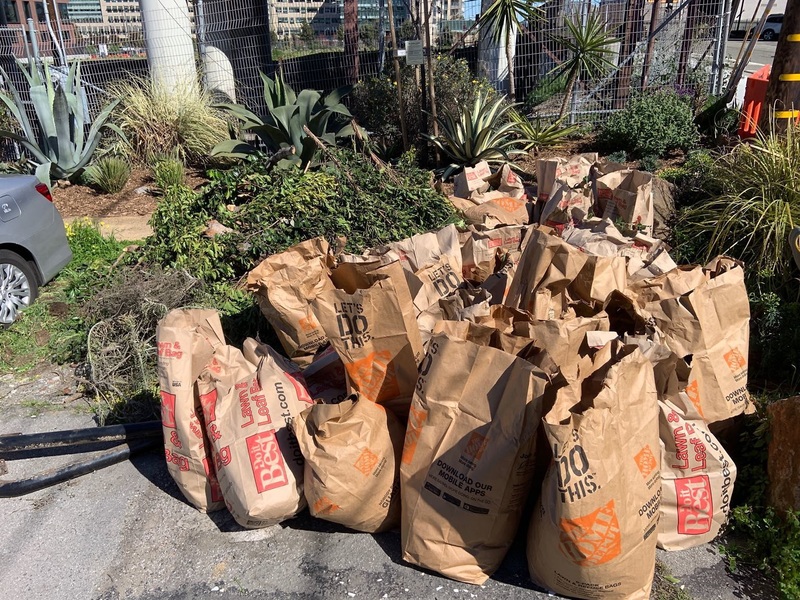 The teams set to work as quickly as they could, but as the day wore on I was worried chips might be left in the pile - which means I'd have to move them myself somehow, as we cannot fill parking spots with wood chips. I decided to strategically bet John $10 that his team couldn't finish the task in the time allowed. Challenge accepted: John rallied his team and they plowed on. 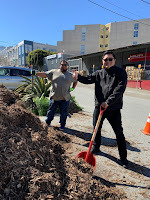 I finally called time at 2pm, but the mulching teams kept wheelbarrowing mulch down the street until it was all gone. Troopers! I guess I owe John $10 now, but it's money well spent. 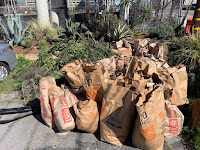 We filled 40+ bags of green waste, piled up and ready for Recology to compost up. That's a truly impressive result. 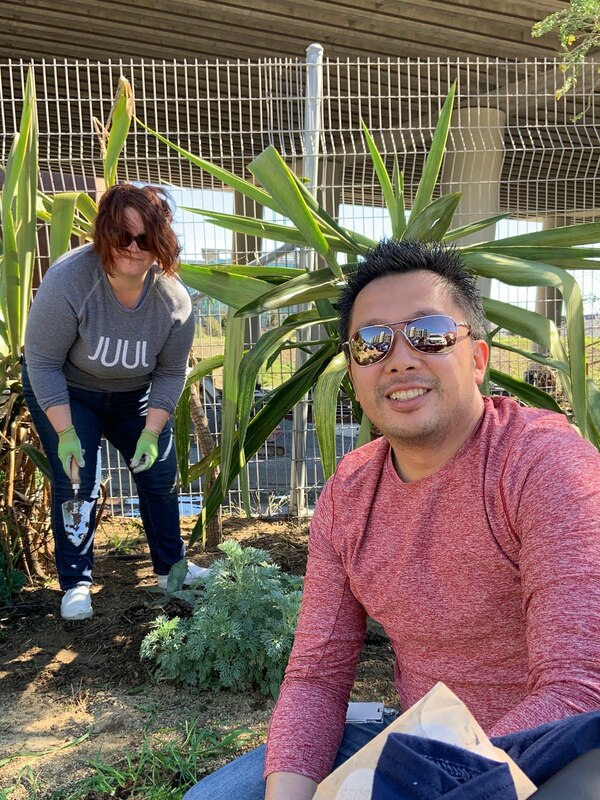 Thank you Juul for sending your finest people over to make Potrero Hill gorgeous. Have a walk down the block soon and enjoy the clean beds. 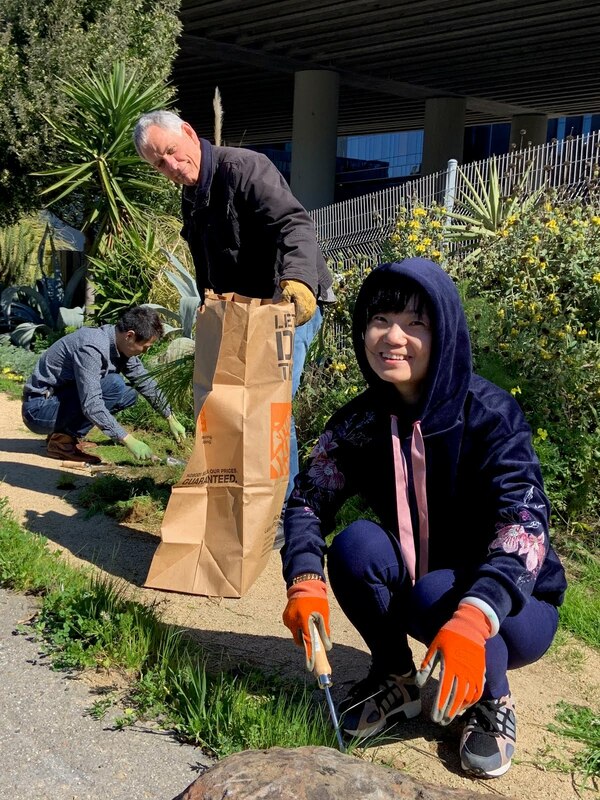 We have a few weeds left over - we do need a few for our next volunteer day on April 6th and with GoodData in May, after all. Hah! Whew! You got it all moved! It was a huge area, it must look great now. Glad to see you had blue sky for the Juul volunteers. Plant Profile: Yucca "Blue Boy"